The trabecular wall structure of every caryophylliid begins as a marginotheca, but transforms into a septo- or parathecal wall later in ontogeny, these more mature wall structures usually having well-developed costae . 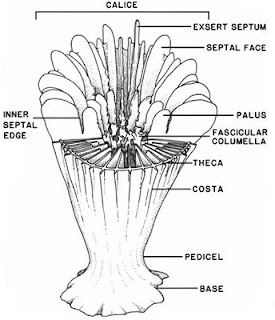 The caryophy lliids are extremely diverse in morphology, having a variety of palar shapes and configurations, columellar types, and corallum shapes. Corralum short, attached, wall rather thick, ornamented externally by 24 costae. Trochocyathus woolmani Weller 1907 p 268, pl. 5 taken from Vaughn 1900. This species is described in Weller 1907 but not in Richards 1958 . Corallum short cornute, rapidly increasing in diameter. Corallum subcylindrical in form, with a broad spreading base. The calice is very deep, reaching almost to the base of the corallum.